LondonBelle announces the launch of ZUCA's The Flyer to the UK market, providing a revolution in luggage for the regular business traveller. 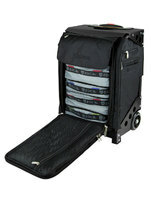 Compatible with the hand luggage restrictions of most worldwide carriers*, The Flyer offers a totally new and practical solution to the business traveller. Lightweight aerospace technology, durable fabrics, and multiple compartments mean frequently used effects are always fully protected and within reach. The Flyer includes five colour coded internal 'drawers' to enable easy packing, and also a fully airline security compliant see-through cosmetics case. All the water-resistant internal packing pouches are fully removable. The Flyer is also equipped with a reinforced frame, doubling the case as a strong seat, capable of supporting weight up to 300lbs. This makes the case an ideal travelling solution for those who suffer waiting times at stations and dreaded airport check-in queues. The 'seat' can also be used to support the weight of additional baggage if required. This revolutionary business travel solution is set to hit stockists in the UK from June 2013, and pre-orders are currently being taken from the website: londonbelleltd.co.uk. Famed for their sporting bags (ZUCA Sport) loved especially by the ice skating fraternity, and the ZUCA Pro Artist cases favoured by the mobile cosmetics trade, ZUCA's new addition marks their move into business travel. The 'ZUCA Sport' is the most popular of the currently available range, and is popular with sports enthusiasts of all kinds. It has recently found fame as the preferred baggage of the Dancing On Ice skaters. *The dimensions of The Flyer have been checked against most worldwide carriers' hand luggage guidelines including BA and EasyJet. The only dimensions for which we have found it not to be compatible are Ryanair. The ZUCA Flyer's RRP is £264.